If you have a weekend free this summer and looking for kayak training in a very relaxed environment, make your way to the Ontario Sea Kayak Centre, located 2.5h north of Toronto in Parry Sound. For the first time they are offering a series of theme weekends covering a wide variety of topics including Greenland Paddle building and rolling. Paddle building and rolling is fine and all but I want to highlight two other programs also going on. The first is that I'm teaching a navigation and weather themed weekend coming up in just a couple of days. We will be covering stuff like trip planning, on-water navigation and the basics of weather forecasting as well as getting out and checking out the sights and sounds of Georgian Bay’s 40,000 islands. In the past have you gotten lost listening to a friend trying to explain the wonders of navigation? I will try to sort it out for you. It will be practical, nerdy but certainly not boring. Another weekend that looks amazing and you should for sure think about attending is the leadership and risk management weekend hosted by Alec and Sharon Bloyd-Peshkin of Have Kayaks, Will Travel Paddlesport Coaching in Chicago. Over the weekend they will be covering the latest and greatest kayak rescue techniques as well as how to manage incidents on the water. Of course it won’t be all rescues all the time and they will also be working with students to improve strokes and paddling technique. With a small class there will be lots of one on one time. I know these guys love having fun on the water so I know you are going to have a great time. Looks interesting? You can find more info about the training weekends here. If you are like me and you sometimes find it tricky explaining to your students the complex interactions between Low and High pressure systems or weather forecasting you need to pick up the amazing resource, The Weather Cycler. The Weather Cycler is essentially an 8.5"x11" cardboard slide chart and guide for interpreting and forecasting weather. What makes it very cool is that when you slide the inner card out, it creates a simple animation of a low pressure system moving into your area. While the animation is happening, there are other cut outs on the page that demonstrate expected weather, pressure and cloud formations at any given point throughout the weather system. It’s a fantastic resource. If you are looking to pick one up check with your local science shop to see if they have it though you will likely do better ordering it online. I recently picked up mine from the gang at Body Boat Blade and it was $12.50 plus shipping. Since I teach kayaking, I find myself often talking to students about weather and science behind weather forecasting. I used to always be nervous talking about weather since it can be one confusing monster to understand (let alone explain) and even the best meteorologists can get it wrong (especially when predicting your upcoming weekend weather). Over the past several years, one of my goals has been to figure out ways to explain the science without overloading students with extremely technical descriptions or complex lectures. With that in mind I’m always on the lookout for new resources. The other day I stumbled upon this really good video published by PBS that explains where wind comes from. You should take a look. Quick Teaching Tip: If you find yourself struggling to find resources or ways to communicate a particular theory topic (eg. navigation); focus on resources online that are aimed for teachers in elementary schools or kids themselves. The information is often presented in a more simplified style and the depth of knowledge is often just perfect for your students. For example, I found this amazing article that goes in a touch more depth about what causes wind and the influence temperature has on the weather machine. Here's something that's pretty amazing: all of the tiny, invisible molecules that make up the air have weight. They don't weigh very much (you couldn't put one on your bathroom scale), but their weight adds up, because there are a LOT of molecules in the air that makes up our atmosphere. All of that air is actually pretty heavy, so the air at the bottom of the atmosphere (like the air just above the ground) is getting pressed on by all of the air above it. That pressure pushes the air molecules at the bottom of the atmosphere a lot closer together than the air molecules at the top of the atmosphere. And, because the air at the top of the atmosphere is pushing down on the air at the bottom of the atmosphere, the air molecules at the bottom REALLY want to spread out. So if there is an area where the air molecules are under high pressure (with a lot of weight pushing down), the air will spread out into areas that are under lower pressure (with less weight pushing down). Don't forget that there is also a pile of free teaching resources available for your taking over in the resource area here at the Headquarters so start clicking! I don’t care if we find out tomorrow that this is a fake. To me it will always be the greatest hurricane forecast ever. Apparently this type of thing is popular among weather service staff for storms that have overstayed their welcome and continue to dwindle in the North Atlantic, or for storms that pose no real threat to life. Boing Boing posted this very interesting video today on how the National Oceanic and Atmospheric Administration (NOAA) develop weather forecasts. Since it was something that I never really thought about before, I thought I would share it with you. Google just introduced a new weather layer to their Google Maps system. You can turn it on by hovering the mouse over the graphic in the upper corner of the map and selecting the weather layer. Powered by weather.com, the new weather layer gives you the current temperature as well as forecast and temperature for the next four days. If you are looking for more detail you can click through to weather.com for more extended forecasts. I can see why Google decided to keep it simple since most people don’t care about wind, barometric pressure or other weather nerd stuff like that but I wish it would click through to that type of thing. Don’t be heart broken. The king of Google Maps/weather mash-ups is still Weather Underground’s WunderMap which is by far your best resource if you want weather information that’s deeper then the Channel 5 weather girl but not so confusing you think you just signed up for a university course. You can zoom in on your local paddling destination and turn on the weather stations layer and you can see exactly what’s going on around in. Looking for severe weather? There is a layer for that but to me the strongest feature is the storm tracker. When enabled, it displays an ice cream cone shape displaying the storm direction as well as the projected location for the next 15, 30, 45 minutes. Did I tell you this same map is mobile phone friendly? It’s a great resource for getting that last minute update on surrounding storms just before hitting the water. Other Weather Sites I’m a fan of? Check out Wind Finder or Wind Guru for solid wind prediction and Weather Underground’s Marine Maps. They are slightly more technical but they also provide excellent history for things like water temp, wind direction, speed and wave height. Want to see average wave height for the 3rd week of October, 2001? They will tell you. 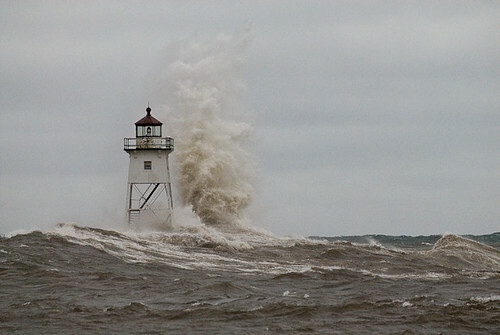 The Great Lakes were hard this week by wind. By wind, I mean windy wind. So much wind that the NOAA actually named the storm The North American Extratropical Cyclone of October 26-27, 2010. Lake Superior got hit the hardest. Friend of the site, Bryan Hansel from paddlinglight.com has been documenting the destruction and awesomeness in Grand Marais, MN so check his flickr page full coverage. With all that wind, how high were the waves you ask? Well, a buoy on Lake Superior was measuring waves at over 5.7 meters high. For you Americans, that’s 18.7 feet! Remember, that’s freshwater and not the ocean. Let it never be said that the Great Lakes are nothing like the ocean. Lake Ontario was on the outer fringes of the weather system so we didn’t have the same high wind or waves compared to Lake Superior but they were big enough for sure! Wind waves larger then 6ft are just too scary for me. Here in Toronto we couldn’t pass up on such a good opportunity to get out and play so yesterday I went to work early and also worked over lunch so I could duck out early before closing time. My paddling partner Erik and I headed out from the Toronto Harbour to the Western Gap and fooled around there. The Western Gap is a great training ground in rough water as the water bounces around and quickly turns into clapotis waves. I have written about the Western Gap before as a great training ground before. With all the clapotis wave action in that area, it isn’t uncommon for the water to fall out from under you and drop 3-4 feet with no warning. It’s worse then a rollercoaster because if you don’t see it coming it can be a little unnerving. Once we got bored of the wave elevator ride we headed off south around the point to the “clothing optional” beach for some fantastic surfing in the consistent 6 foot swells that were forming. After a couple of runs we had to head out pretty quick as our path home took us back through the Western Gap chaos and needed to get through before we lost all our light. Now that would have been scary! For reference, the breakwall you can see in a couple of photos is six feet out of the water. On a completely different yet similar note, my friend Mike sent me a link last night of crazy boogie boarders playing around in a clapotis wave refracting off the sea wall. This just in: My friend Megan from Naturally Superior Adventures on Lake Superior just sent me this report of the gang out surfing. Sounds mental. If you hurry today you might still catch some of the action on their live webcam. Megan also posted a great collection of storm photos on the NSA blog. The lightstand in the photo below is 20 feet high. The gang came back at lunch and said that it was a bit intense. One report was that Ray was completely vertical and yet his whole hull was still on the wave. Another was that Ray did a surf ender where his bow just stayed under the water while he got surfed in. He said he didn't feel too heroic afterwards just trying to breathe. They think the river mouth might be a bit too big of this afternoon but were just going to check it out. They might go back to Sandy or try Celery Beach. I might go out and take some pics later but wish that the sun would at least try to show up. Super grey here. I never realized that being a weatherman was so dangerous! Here is a fantastic video produced by NOAA Environmental Visualization Laboratory. It’s a compilation of all the satellite images taken by the GOES satellite during the 2008 Atlantic Hurricane Season. From the website: The GOES satellite is North America's first line of defence in identifying and tracking any tropical cyclonic activity. Every 15 minutes the GOES satellite acquires a new image of the Northern Hemisphere. Using data from the infrared water vapour channel, it is possible to see the storms, as well as the high pressure areas that affect their movement and intensity. Sadly, the video can’t be embedded into other sites so you will need to click through to actually watch it. Thanks for Andrew for the tip!